While a PowerPoint 2011 for Mac slide show is running, you’ll see buttons appear when you move the mouse cursor. After a few seconds, the buttons dissolve away but return when you move the mouse. These buttons provide the same options that you see when you right-click anywhere on the slide while the show is running. Left Arrow: When clicked, runs the previous animation. If there are no previous animations, the previous slide is displayed. Right Arrow: When clicked, runs the next animation. If there are no animations remaining on the slide, the next slide is displayed. Pen tool: Activates the Pen tool menu. Show controls: Displays a pop-up menu of controls for your show. The same controls also show when you right-click on a slide. 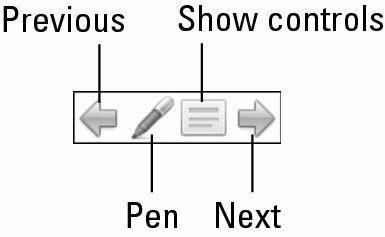 In a running presentation, click the Pen. 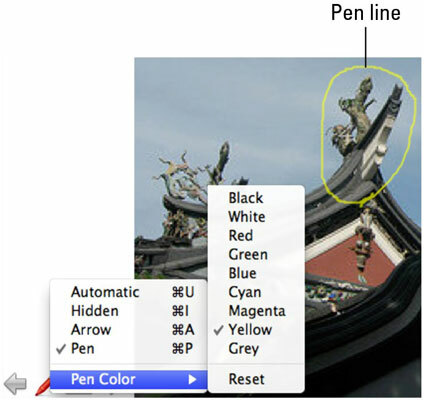 From the pop-up menu, choose Pen Color→Color. Hold the left mouse button down and drag to draw on the slide. When you’re done, click the Pen Tool button on the slide again. From the pop-up menu, choose Automatic. Go to Slide: Choose any slide from the pop-up menu. Custom Show: Choose a custom show from the pop-up menu. This option is grayed out if you have not made any custom shows. End Show: (or press the Esc key) Ends the show and displays Normal view.